Saturday is normally the Weekly Photo Challenge. Well, this will be challenging since I don’t know what the theme is all about. I am going to post just the same to throw off some equilibrium in the blogging world. Naughty, naughty. Pow… Pow… Wow.. Wow. Put it together. Pow Wow. 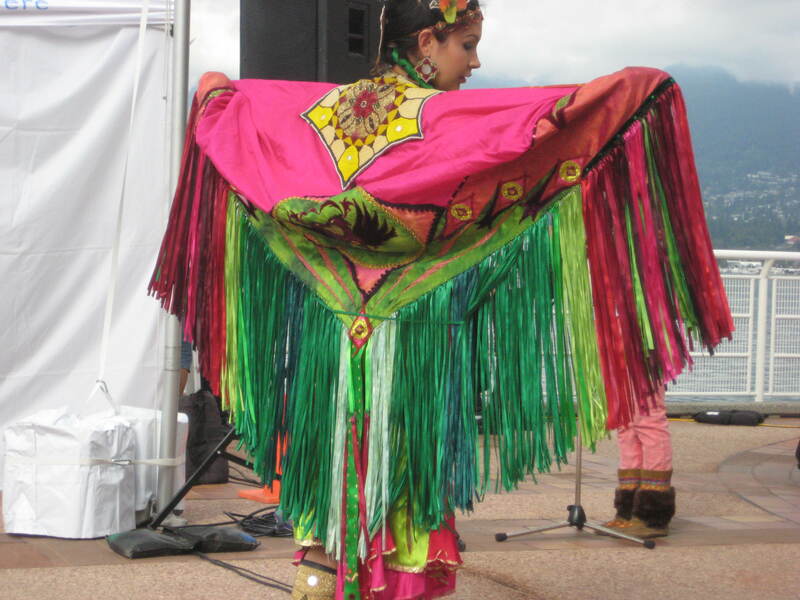 Pow Wow is a gathering of Aboriginal First Nations and non-aboriginals. It is steep with legend and tradition. 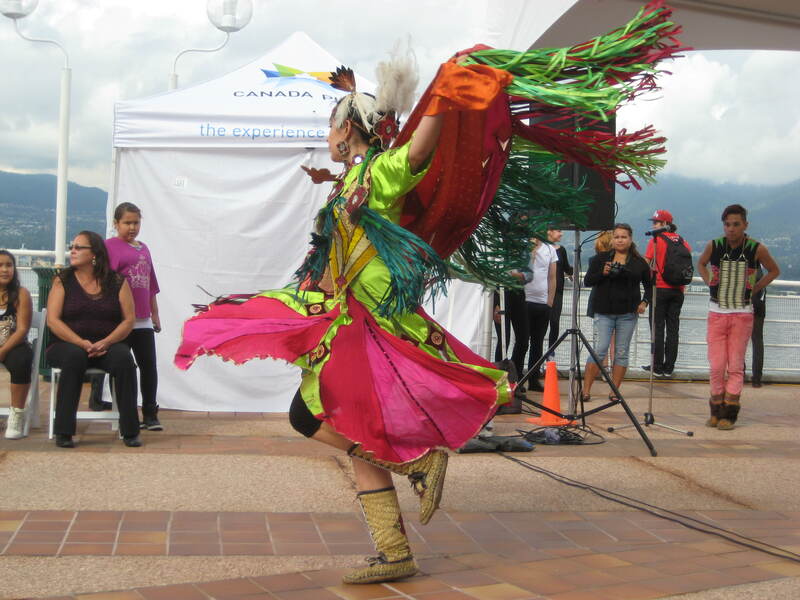 We had a First Nation celebration on September 21, 2013 as part of the Reconciliation, Walk with us. This is the dance of Metamorphosis of a Butterfly. The colourful shawl is the wings of the butterfly. She danced to the beat of the drum. Slowly as she emerged from her cocoon. Gradually her feet moved two slow steps. As she transformed into a butterfly, the steps criss-cross, legs started to jump and opened her wings to show her true self. A metamorphosis of beauty. At the end of the show, we were invited to learn the dance and performed the dance with her. Okay, easy peasy. 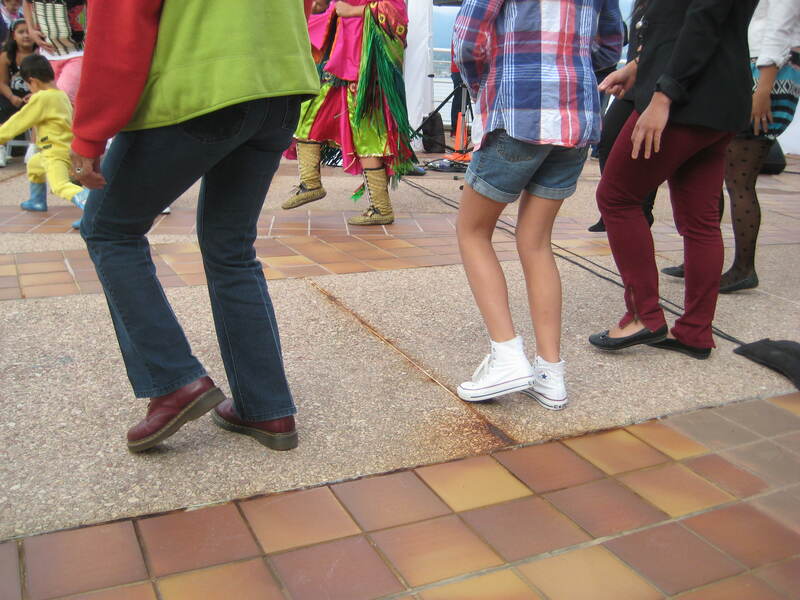 That’s me in red shoes with my two nieces. Not showing you how I tripped when my feet got all tangled. I must say it was fun. The day I took the children to Pau Wau will be told and retold to their siblings, cousins, friends and hopefully to their future family. The story of the First Nation will remain in history forever as we continue the dance to healing and metamorphosis to a beautiful butterfly – ad infinitum. Let it be written, Let it be done. The gathering of Truth and Reconciliation Commission ended with the walk in solidarity with the aboriginals and non-aboriginals. Thousands braved the day in a wet, wild, and wonderful walk. We were banging drums, singing traditional songs, wearing button blankets and hats as we marched along the Georgia Street. The stories told were very horrific and sad about the treatment the aboriginals received from the white people especially at the residential schools. These are the survivors who came to have their stories documented for the history books. As horrific as it was, the gathering will be the beginning of a journey toward reconciliation. Canada is stepping forward to share the pain it created. From here, we can move towards healing. The keynote speaker for this event was Dr. Bernice King, the daughter of Martin Luther King, Jr. There are so many activities that are worthwhile today. Which walk should I attend? When I started planning today’s walk, the first option I chose was AIDs walk. I have supported this walk since I have I know people who have this disease. Now, it’s just another illness like a common cold. The only thing is there is no cure, only prevention. It is a good cause. These walks are about Reconciliation. I think it will be a gathering of all Nations to walk towards reconciliation. Reconciliation is a good thing in order to have peace and unity. It will be a very interesting day. Not only I will be with esteemed leaders such as Suzuki and the Elders, Dr. Bernice A. King, a Baptist minister and the youngest child of iconic U.S. civil rights activist Dr. Martin Luther King, Jr., will deliver the keynote address at the start of Canada’s first-ever Walk for Reconciliation. Sorry, Aid Walk Vancouver some other day. I have a better offer.